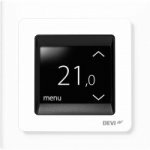 DEVI thermostats are primarily used for standard electric underfloor heating installations and are suitable for most projects. The DEVI thermostats range from cost-effective, basic thermostats to the latest energy-saving, digital and touchscreen thermostats which incorporate the latest technology ensuring total control from the initial setup. Yes, we include a DEVIreg Touch programmable thermostat in all of our kits. This stylish cutting edge thermostat uses pulse width modulation with optimum start and optimum end programming as well as open window detection to guarantee extremely high temperature control accuracy, ensuring the DEVIreg touch is one of the most efficient Underfloor Heating controls available. 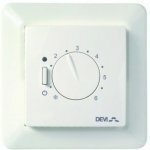 Is the DEVIreg touch programmable thermostat a compatible replacement for the DEVIreg 500 thermostat? The DEVIreg touch programmable thermostat is a perfect replacement for the DEVIreg 500 thermostat and directly compatible with the existing floor probe. However, the connections may need a qualified electrician to adjust the wiring as the base plate is different. Which type of thermostat should I choose for my underfloor heating system? When choosing a thermostat for your underfloor heating system you need to decide what characteristics you want from your thermostat. Manual - A manual thermostat will provide total control when using your underfloor heating. Simple to use, they are ideal to manually regulate the temperature for almost any underfloor heating application. Digital - Programmable digital thermostats are a modern and timeless alternative to the manual thermostat, offering complete control for your underfloor heating. Automatically adjusting the heating to meet your comfort level, regardless of changing weather conditions by measuring the floor temperature and combining it with the air temperature. Touchscreen - A touch screen thermostat will provide stylish total control of your electric underfloor heating system. Touchscreen thermostats can be combined with an existing system, providing a smart yet simple upgrade with advanced intelligent energy-saving features to cut heating bills without compromising comfort. received the information I required. Thanks for your help. Thank you very much for the fantastic review of our service and advice, we appreciate the 5 star feedback. Good quality stock at good prices.....and free delivery!! If only all companies operated like this.....if ! Having dealt with this company before, I already had a contact name in this firm, who knew of me, found my details and handled the new sale without hindrance. Brilliant to hear, thank you very much for the great review of our efficient service. I will pass on the fantastic feedback to Liam and we look forward to hearing from you again soon. Order arrived within 2 days 1st class service. Brilliant, thank you for the really great review of our service and delivery. This item replaced an older unit that had stopped working. Easy to install and use. Very pleased with it. Thank you very much for taking the time to review us as excellent, we appreciate it very much.